Red blood cells (RBCs), also known as erythrocytes, carry oxygen throughout the body to nourish tissues and sustain life. Red blood cells are the most abundant cells in our bodies. On average, men have about 5.2 million red blood cells per cubic millimeter of blood, and women have about 4.7 million per cubic millimeter of blood. Each red blood cell contains 280 million hemoglobin molecules. Hemoglobin is the most important component of red blood cells. It is composed of 4 protein subunits (globulin) bound to a heme group, which contains iron. Click the icon to see an image of the formed elements of blood. Click the icon to see an image of hemoglobin. 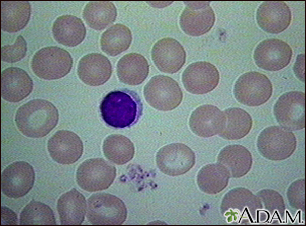 Click the icon to see an image of megaloblastic anemia. Click the icon to see an image of sources of vitamin B12. Click the icon to see an image of foods to avoid if you have celiac sprue. Other hemoglobin measurements, such as mean corpuscular hemoglobin (MCH) and mean corpuscular hemoglobin concentration (MCHC) may also be calculated. Click the icon to see an image of sources of vitamin B9.